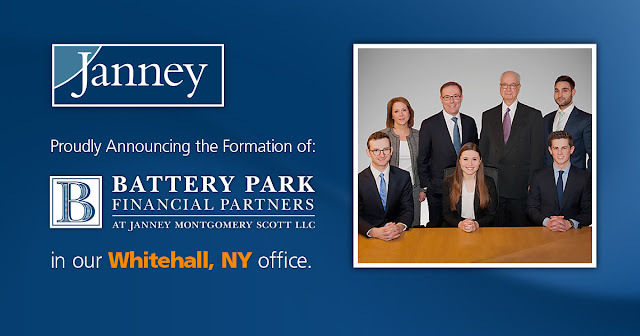 New York, NY – March 6, 2017 – Janney Montgomery Scott LLC (“Janney”), a leading full-service wealth management, financial services and investment banking firm headquartered in Philadelphia, Pa., announces the hiring of Senior Vice President Noah Doyle and Vice President Charles Princiotto, formerly associated with Merrill Lynch. Doyle and Princiotto will be joined by Sean Martin, also formerly associated with Merrill Lynch. Doyle previously managed Doyle & Associates at Merrill Lynch Wealth Management. Doyle, Princiotto, and Martin will join veteran Janney financial advisors Stanley Hochhauser and Alice Coraggio in forming Battery Park Financial Partners at Janney Montgomery Scott LLC. Doyle, who will lead Battery Park Financial Partners, currently manages over $150 million in client assets together with Princiotto. Hochhauser and Coraggio manage over $200 million in client assets. Together, the new group fuses the mindsets of a diverse group of advisors with a wide range of expertise and will manage more than $350 million in assets. Hochhauser has more than 50 years of experience in the financial services industry and Coraggio, who has worked with Hochhauser for over 17 years, has been in the industry since 1979. For decades, Janney has served as a landing spot for advisors seeking a commitment to working closely with clients and providing comprehensive financial plans and investment management. The partnership with Doyle and Princiotto underscores this dedication to attracting talented advisors while solidifying the firm’s quality of service and longevity. In addition to leading Battery Park Financial Advisors, Doyle currently serves as Chair of the Board at Bronx Community Charter School, is the Founder and President of the North Fork TV Festival and is a Graduate of Cornell University's School of Industrial and Labor Relations and Brooklyn Law School. Princiotto, who will serve as Vice President, Wealth Management, holds the CFP® designation, is co-founder and director of the Kids Dream Big Foundation and is a graduate of DeSales University with a bachelor’s degree in business management. With his Series 7 and 66 licenses, Martin has worked closely with Doyle at Doyle & Associates since January 2015 and will handle various client accounts in his new role as Account Executive. Janney provides advice to individual, corporate and institutional clients. Our expertise includes guidance about asset management, corporate and public finance, equity and fixed income investing, equity research, institutional equity and fixed income sales and trading, investment strategy, financial planning, mergers and acquisitions, public and private capital raising, portfolio management, retirement and income planning, and wealth management. Janney is an independently-operated subsidiary of The Penn Mutual Life Insurance Company and is a member of the New York Stock Exchange (NYSE), Financial Industry Regulatory Authority (FINRA) and Securities Investor Protection Corporation (SIPC). Additional company information is available at www.janney.com and twitter at @Janney1832.